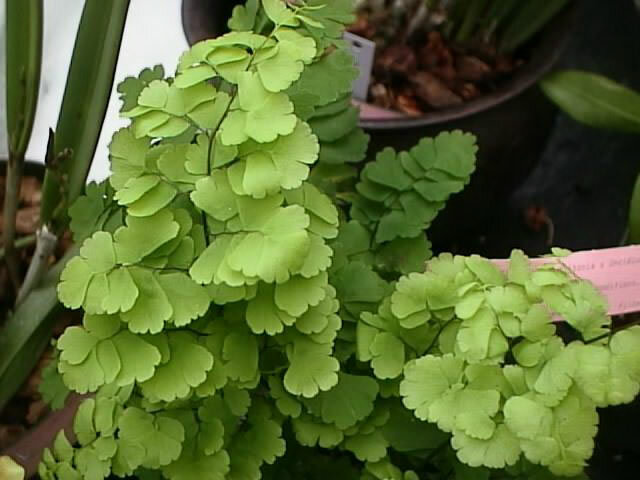 Delta Maidenhair Ferns are elegant, fast growing, evergreen foliage plants with delicate, lacy fronds that are held on wiry, 6"-12" black stems. 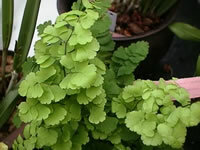 Maidenhair fronds are composed of bright green, triangular leaflets and can grow up to 12" wide and 18" long. The plants themselves will spread to about 24". They are long lived plants when they receive sufficient humidity and are not exposed to drafts, gas fumes or cigarette smoke. Maidenhair Ferns are only hardy in USDA zones 10-12 so they are most often grown as house plants. and night time temperatures of 55°-60°. In order to thrive, they must have high humidity and consistently moist soil. Ideally, your Maidenhair Fern should be kept in a terrarium environment, but if that isn't practical you should provide additional humidity by setting the planter on a tray filled with moistened pebbles or placing moist, fresh sphagnum moss around the plant. A strategically placed aquarium will help raise the humidity as well. Regularly misting the foliage with room temperature water is also very beneficial. Keep the soil evenly moist, but cut back on watering slightly in the winter. The roots must never be allowed to dry out. Never allow potted plants to sit in water for more than an hour or two! Feed monthly from spring through mid-summer, using a half strength solution of a soluble, house plant type fertilizer. Remove dead or damaged fronds regularly by cutting the stem back to the base. 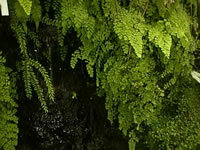 Maidenhair Ferns are occasionally attacked by scale insects and mealybugs, so check undersides of the fronds regularly. well-drained potting mix, in a planter with plenty of drainage holes. Never use a pre-fertilized planting mix for container grown ferns! This is a good time to propagate a few new plants. Maidenhair Ferns grow from rhizomes that spread under the surface of the soil, making them very easy to propagate by dividing the roots into three or four pieces in early spring. Each section should contain a minimum of two or three healthy fronds. Ferns do not produce flowers, therefore they cannot produce seeds. They reproduce with spores that form on the underside of the fronds. Propagating ferns with spores is a fun and fairly easy method of growing new ferns, but it can take 3-4 years to grow a mature plant.